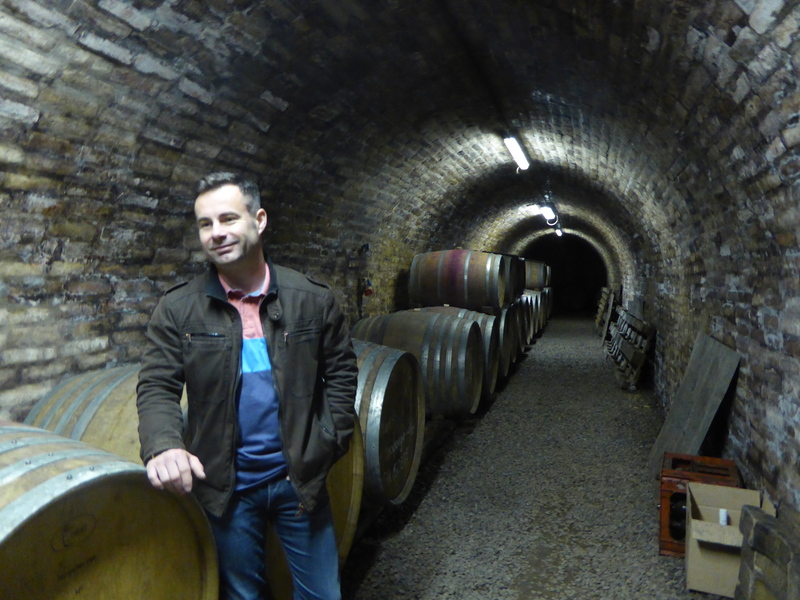 On a visit to Sebestyén Csaba’s winery in Szekszárd earlier in the year, I was fortunate e nough to be presented with some wines to be tasted at my leisure, their tasting room being under reconstruction at that moment in time. As the weather at the moment does not really lend itself to tasting (and enjoying!) full-bodied reds, which comprised half the goodie box, I decided to taste two wines more appropriate for summer drinking, the 2014 Cserszegi Fűszeres and the 2013 Kadarka. First up, th e Cserszegi Fűszeres. A refreshing, light summer wine, with crisp acidity. Spicy and rich with a burst of exotic fruits. Perfect as an aperitif in this hot weather. The Kadarka, a cultivar very typical to Szekszárd, was a beautiful bright ruby colour, with spicy aromas of cherry and raspberry, with a touch of herb and some earthy notes. Smooth round tannins and fresh acidity make this a perfect light summer red. Delicious. Since the fall of Communism twenty-five years ago, Hungary has been trying to rebuild its wine industry once again and restore the image of quality wine which many of the regions in the country had once been known for. During the cold war period, Hungary was pushed to churn out gallons of low-quality wine to serve other countries in the Eastern Bloc. Most of its vineyards were turned into cooperatives and quantity was the main goal, not quality. Since then many winemakers have been making efforts, and succeeding, in doing just the opposite, producing innovative, quality wines and increasingly focussing on indigenous varieties such as Furmint, Hárslevelű, Kadarka, Kékfrankos, Irsai Olivér and the unpronounceable Cserszegi Füszeres. However, unlike countries like France, Italy and Spain, where most renowned wine regions are known for producing either wine in a certain style, full-bodied reds from Bordeaux, or from certain grape varieties, e.g. 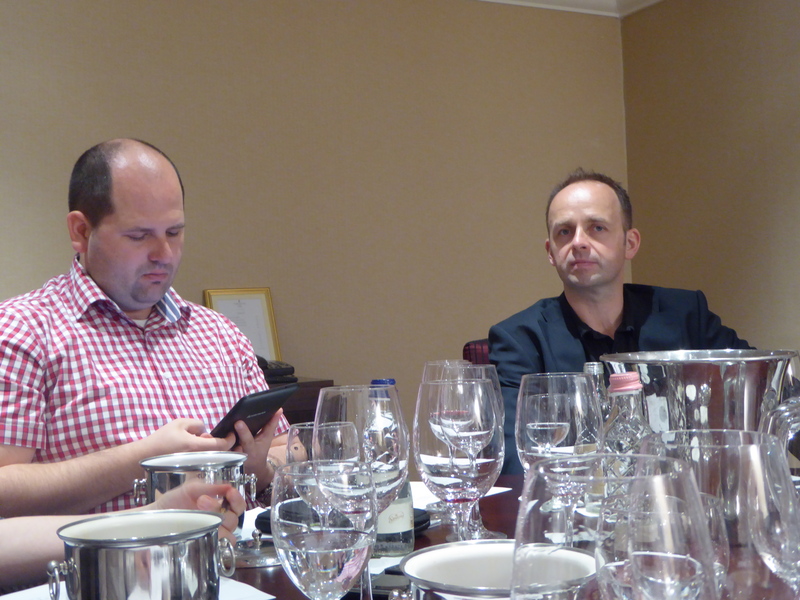 Pinot Noir in Burgundy, the majority of people look blank when asked about Hungary. If you are very lucky, they may come up with Tokaji, most probably meaning aszú, but are unlikely to know what grape variety it is made from. They may indeed proffer Bull’s Blood if they remember the days of the full-bodied, yet at that time rather rustic, red wine from Eger which could be found on the UK supermarket shelves in the 80s and 90s. Indeed, even within Hungary itself, the identities of many of the wine regions are not particularly clear to the majority of people, perhaps not even to the winemakers themselves, who are often producing a vast range of wines from an array of grape varieties. Some regions are now trying to create a more homogenous image for themselves. For example, Csopak has created a Codex, focussing on Olaszrizling (Welschriesling), Villány with Cabernet Franc and, of course, Tokaj with its sweet wines, in particular aszú, and now increasingly flavoursome and full-bodied dry whites from Furmint and Hárslevelű in particular. Another such region that is making a concerted effort to build a consistent and positive image of itself is Szekszárd. This is a wine region located in the south of Hungary, generally known for its full-bodied reds. Typical wines produced in Szekskárd are very often based on Carpathian Basin varieties, such as Kékfrankos and Kadarka, either varietals or as a blend, e.g. Bikavér (Hungarian for Bull’s Blood) like in Eger. Moves are being made to focus on these particular wines. A new slogan has been chosen by the winemakers – Szekszárd – Kulcs a szívedhez, i.e. key to your heart, and a tasting of mostly these wines took place recently at the prestigious Corinthia Hotel in Budapest. Questions, however, still arise. Even if they focus on these varietals and kinds of blends, what should they actually be like? What style wines should be produced? What should a bikavér consistent of? What should a Kadarka be like? Has anyone outside this region actually heard of it? Should it try to ape Pinot Noir? To which it is similar in some ways, being a thin-skinned and sensitive variety producing pale, light wine. These questions are obviously being considered by the wine region and winemakers themselves. Research is being done. Clones are being collected. 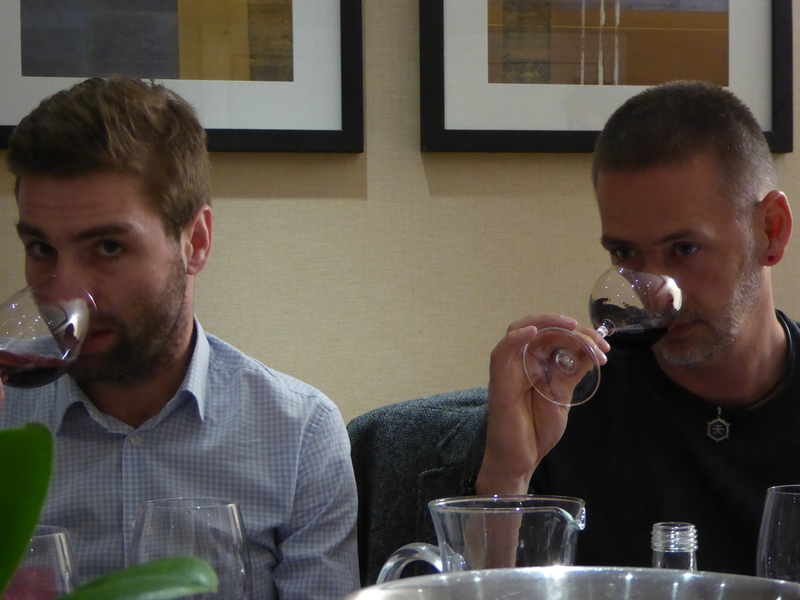 Regular tastings are held, both by the winemakers themselves and for the general public around the country, such as the event two weeks ago. In connection to these large public tastings, a select gathering of wine writers, academics and other professionals under the expert tutelage of Gabriella Mészaros gathers prior to the large events in order to taste according to a certain theme and to consider such questions in the light of the wines tasted. Whether Bikavér can age well was considered earlier in the year and this time we were looking at various styles and ages of Kadarka. The variety itself and its character. Which direction should Kadarka wines go in? Many wines are now produced in a more structured, spicier direction, with more intensity, colour and tannin, perhaps due to the new world influence, as that is often what competition juries are looking for. Kadarka as a grape. What is Kadarka actually? Thirty concrete clones have been collected. In addition, there are various cultivars known as Kadarka, but which are not actually Kadarka. There is currently 700-800 ha of Kadarka planted in Hungary, with an increase of 10% in the last years, most of which is in Szekszárd. Eger is the second region in Hungary where Kadarka is on the increase; Nagy Eged, with its limestone soils, makes some nice, elegant wines. Szekszárd itself produces generally reliable, good, average quality, although there are some outstanding examples, too. The main problem appears to be connected to its type. It’s a bit like Pinot Noir, similar in that it’s not like normal reds – thin skins and low tannin – so it is difficult to categorise, although generally does not produce wines of such high quality as Pinot Noir. There is a clear need to create an identity for it. The ‘picture’ has started to crystallise a little over recent years – a pale, light wine with crisp acidity, spicy, but without overcooked fruits. It should perhaps be considered on a national level how to do this, not simply on a regional basis, which seems to be the case at the moment (not only for Kadarka in particular); how to create the image of an outstanding Kadarka. 2014 was an unfortunate year for Kadarka due to the poor weather conditions and extreme rainfall, particularly coming at harvest time, making it difficult to harvest healthy grapes, thus a lot or rosé was made instead of red, two of which we tasted to begin with. The first from Mészáros Borház was an attractive pale pink with a clean fruity nose, crisp and refreshingly dry, with bags of elegant red fruit, particularly cherries and strawberries. The second, from a well-known producer, was clearly out of condition, lacking in fruit and with a rather cidery touch to it. We planned to give it a second chance at the end, but unfortunately ran out of time. The reds were a mixed bag to say the least, with a fair few again having some kind of fault. One or two were not even in a condition in which it was possible to taste them. Some were light, easy drinking reds, like Kadarka is generally perceived to be. For instance, the entry level “Sógor” Kadarka 2013 from Eszterbauer Pince. A pale ruby wine with clean, spicy red fruit, some herbal notes and touch of cinnamon on the finish. An elegant, balanced light wine – a good example of a Kadarka. Others were attempting to be more full-bodied and structured, with greater and lesser degrees of success. Given that Kadarka is usually rather low in tannins, many of them were overly tannic, perhaps due to poor use of oak, or poor quality barrels, particularly in one or two of the older wines – we tasted back to 2000. Some excellent samples came from Heimann Családi Birtok. The 2011 had a pale purple colour with a pronounced perfumed, even floral nose, full of fruit – sour cherry, spice, pepper and rosehip on the palate. The 2007 was pale garnet with a slightly oxidised character that lovers of fortified wines such as a Tawny Port would be sure to appreciate. Nutty, caramel, prunes, figs, tobacco all filled the nose and mouth. Not much fruit remaining, but very complex and rich. An older treat. Bodri Pincészet’s 2009 was also a treat. A pale garnet wine, with cherry, tobacco, baked spiced fruit, plums, sour cherry punch, cigar and toast all assailed the senses. A long finish but rather high alcohol. Vida Családi Birtok’s Öreg tőkék Kadarkája 2003 was a good example that Kadarka does indeed have the potential to age, and elegantly too. Cherry jam, tobacco, spicy pepper and some herbal notes were intertwined with purple flowers and anise. A complex, intense wine that would be best enjoyed with food. So what could be concluded from this? 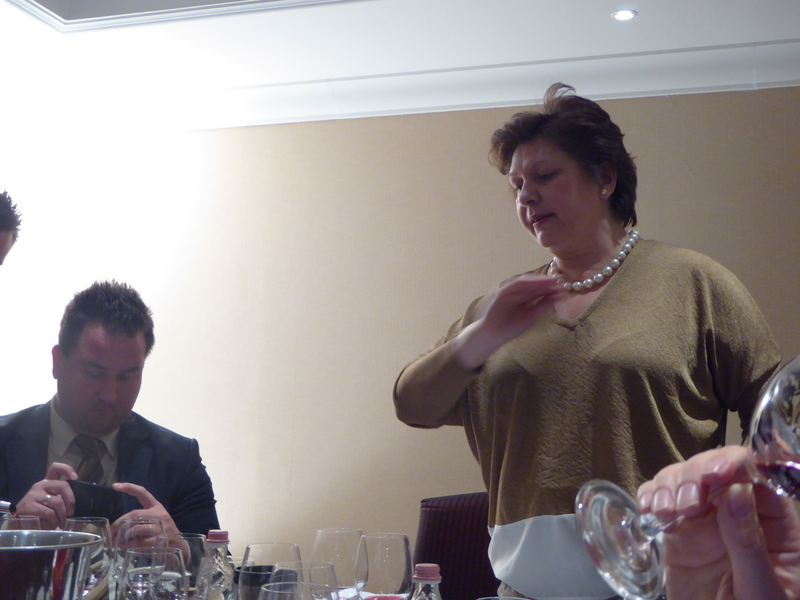 The wines were a real mixed bag – some light and fruity, some overly tannic and full- bodied, some elegant and balanced. Some had aged well, some less so. Clearly there is no concrete identity for Szekszárdi, or Hungarian, Kadarka as yet. There is certainly a lot of work to be done. Should Kadarka be what it truly is, or should it try to conform to the red wine drinker’s image of what a red wine should be? It will be interesting to follow what advances are made in this direction in both Szekszárd and on a national level. We finished up with a Kadarka Törkölypálinka – egészségedre! Forget Spain or Portugal, a major bullfight took part in Budapest last week. The battle of the Bikavérs from Eger and Szekszárd. Both regions produce a blend known as Bikavér in Hungary, in English ‘Bull’s Blood’. This is generally a full-bodied, relatively tannic wine, without too many rules about the composition of the blend, except that in Szekszárd it should consist of at least a total of 40% Kékfrankos and Kadarka combined. They are, however, quite different wine regions. Szekszárd is located towards the south of Hungary, thus its wines are generally rather more full-bodied than those produced in Eger. Nevertheless, that is not to say that the Szekszárd will always be the more full-bodied. In many cases, the Eger versions can be just as big fruit and tannin bombs as the Szekszárd ones. It was a kind of ‘battle of the couples’, with pairs of winemakers lined up next to each other – one from Szekszárd, one from Eger. Twenty-six wineries were represented – thirteen from Szekszárd, thirteen from Eger. Generally the blends presented were Kékfrankos-based – typically 40-50% – with a smaller quantity of Kadarka – often 5%, rounded out with various other grape varieties, often international, e.g. Merlot, Cabernet Sauvignon and Pinot Noir. There did not seem to be a huge difference between the blends from the two wine regions. Participants from Eger: Kovács Nimród Borászat, Gál Lajos Pincészete, Besenyei Borház, Gál Tibor, Juhász Testvérek Pincészete, Gróf Buttler Borászat, St Andrea Szőlőbirtok, Bolyki Pincészet, Thummerer Pincészet, Demeter Pincészet, Ostoros-Novaj Bor and Hagymási Pincészet. Participants from Szekszárd: Takler Pince, Bodri Pincészet, Schieber Pincészet, Sebestyén Pince, Mészáros Borház, Heimann Családi Birtok, Fritz Borház, Merfelsz Pince, Vesztergombi Pince, Pratner Pince, Vida Családi Borbirtok, Eszterbauer Borászat and Bősz Adrián Pincészete. So, what was the outcome? Well, actually, it was a tie, or a draw, if you like, according to the visitors to the sold out event, organised for the fourth time in Budapest.